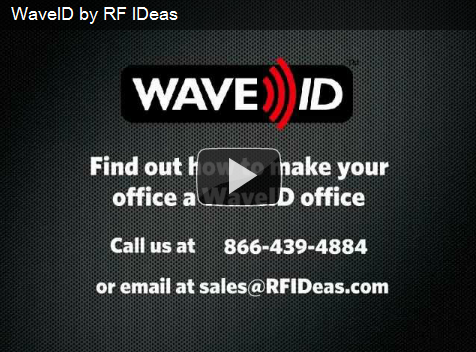 WaveID is the name given to the many badge-based authentication and identification solutions powered by RF IDeas readers. In today’s business environment, most employees carry badges for building access. A WaveID powered business environment exists inside the building, addressing the various ways employees’ access and identification needs are met. WaveID in action is both the physical place for employees to wave their badge for identification, as well as a visual cue that an RF IDeas reader powers this device or solution. A WaveID enabled workplace allows employees to log-in to their computer, release their print jobs, register at their meetings, track their time and attendance, pay for food, and much more, all with the same card they use for building access. WaveID illustrates how the proximity and contactless smart card readers created by RF IDeas provide easy solutions for a myriad of business needs. Though the name WaveID is a relatively recent innovation, the solutions that are powered by RF IDeas’ readers are well established. Hundreds of thousands of RF IDeas readers are in use around the world, supporting solutions like: Single-Sign-On in the medical and manufacturing industries, secure printing in the multi-function-printer market, OEM and industrial access solutions, meeting attendance, time tracking applications, visitor management systems, kiosks, point-of-sale payment stations, and more. With WaveID, customers can now demonstrate how RF IDeas readers provide easy solutions for various business needs, while taking the concept of “Powering the Badge” to a whole new level!